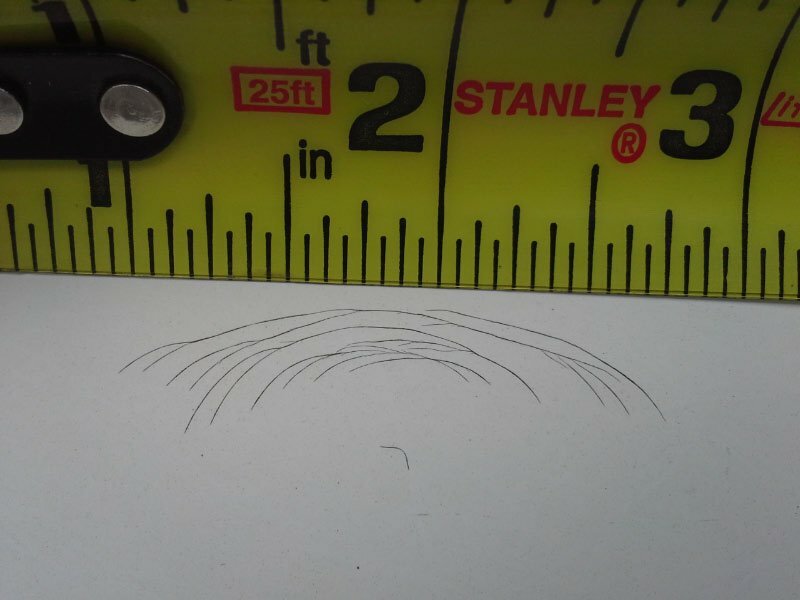 My 2006 Winnebago has hairline cracks in its fiberglass roof on both sides where the roof curves down. See the first picture below for the location of one of the group of cracks. The next photo is of one group of cracks. 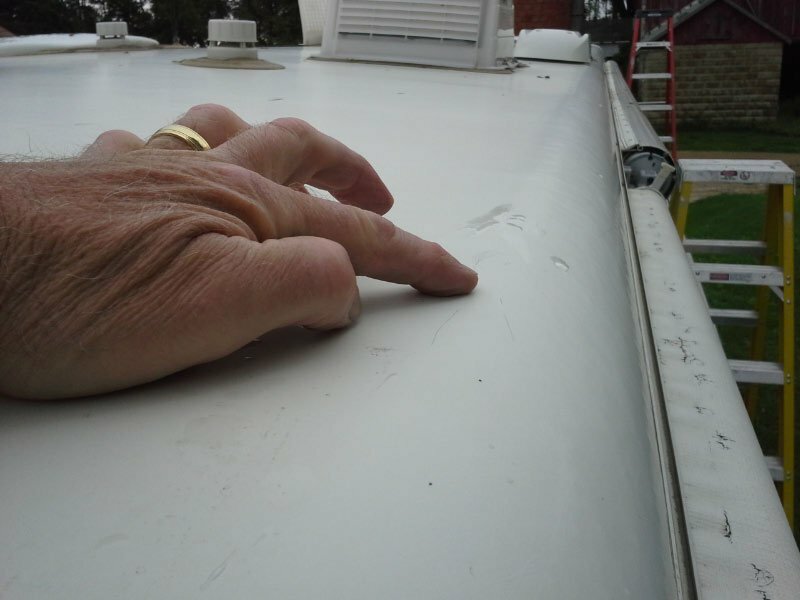 Similar groups of cracks can be found on both sides of the motor home for the entire length of the roof. I noticed the cracks this spring when I replaced the slide out awnings. I am the second owner. I have no way of knowing how long the cracks have been there. Has anyone seen these types of cracks on their roofs? If so, what was the cause and what did you do to fix it? I think they are only in the gel coat, no big deal only cosmetic. JMO, hairline cracks can allow water to seep into fiberglass.Water will ruin fiberglass. I'm beginning to see a few in my roof, so this winter I plan to coat the roof, haven't decided on product yet. Works great for this problem. Clean the area very well and apply the tape over the area. Covering is one strip is the best way to keep any problems from starting. Sorry you are with this problem. I don't know if the cracks will leak but it is better to be safe than sorry. While you are working on the roof, consider doing the gutters. I scrape mine out when needed and use clear Pro-Flex in them. Looks like gelcoat cracks from impacts, perhaps tree stuff. For a quick fix go to a marine supply store and get a bottle of CAPTAIN TOLLEYS Crack Cure Sealant. Thanks for the suggestions. This is exactly what I was hoping to receive. Hail damage does make sense. We have owned the MH for two seasons now (purchased used). It has seen some hail, but nothing too severe when I have been nearby. I do not think that there are any other areas of the MH that have damage associated with hail. The entire roof will get a careful inspection this spring. Since the damage is along both long edges of the roof, I do not suspect damage from tree limbs. Rick, that is a good eye that you have there. My roof to gutter caulk joint was bad when that picture was taken. About 20’ on one side and 24’ on the other side had failed. I used the Manus Bond urethane caulk that Winnebago Outdoors sells to repair the joint. I owe the folks on this forum a big thanks for making me aware of what could happen if one ignores that bit of maintenance. 1. EternaBond® RoofSeal tape < mfg claims that this will work, it is a fast fix & forum members like this product. However, once it touches the roof, it is there for the duration. 2. Dicor RPFRC1 Fiberglass RV Roof Coating < not sure if it will seal cracks for the long term, it looks like it is more of a beautification / heat reduction item than a repair product. 3. TAP Plastic fiberglass gelcoat repair products < time intensive given the area of repair & not sure if it is appropriate for my thin fiberglass roof. This ISC helicopter tape is interesting. I looked at a couple of youtube videos that feature this tape. I like that the tape can be removed and repositioned during installation. The fact that the tape is clear would allow me to see if the cracks grow or are stable. Coupling the tape with Captain Tolley's Creeping Crack Cure maybe the way to go. I like your thinking, Joe. If you had caught this when it first happened your insurance would have payed for a new roof. Winnebago repairs this type of damage by sticking a new fiberglass roof material over the existing one. We were in Forest City when a coach came in needing this done. I'm not familiar with the Manus Bond urethane caulk. I hope it holds up better than the original stuff. We have been in very heavy showers lately. I have no more leaks so I am feeling good. The hardest one to find was from the shower skylight. It had not been sealed correctly from the factory. We are the second owners. The shower area ceiling did suffer damage but we can live with it. Keeping these rigs in good order is a chore and a labor of love if your truly want to be RVing.